Eye surgery can restore a patient’s vision, but only if the surgeon can see the inner structures of the eye clearly. Imaging both the cornea (front exterior surface of the eye) and the retina (rear interior surface of the eyeball) requires a surgical microscope augmented by a specialized viewing system. Such systems can add as much as an inch to the total height of the microscope system, though. That can cause neck and back strain for surgeons, who can spend six to eight hours a day operating. When Volk Optical set out to design the second-generation, automated version of its MERLIN surgical viewing system, its goal was to deliver the performance surgeons demand in the smallest possible form factor. An integrated micro-stepper-motor package from MICROMO (Clearwater, FL) made it easy. Retinal procedures can range from removing a portion of the vitreous humor that fills the eyeball to repairing detached retinas. Surgeons need to be able to switch between viewing the cornea and viewing the retina without delay. The problem is that from an optical perspective, magnification bears an inverse relationship to depth of field. Although surgical microscopes are sophisticated instruments, they cannot keep both the front and rear of the eye simultaneously in focus at high magnification. At the same time, a surgeon doesn’t want to worry about adjusting the focus of the microscope simply because he or she is working in a different spot. That’s where the surgical viewing system comes in. The ideal surgical viewing system would provide a high quality image of the retina while taking up a minimal amount of space below the microscope and requiring little or no additional effort from the surgeon to use it. Typically, they’re accessories to the standard surgical microscope. The MERLIN, for example, sits between the bottom of the microscope and the eye of the patient. It consists of two parts: the lens positioning unit (LPU) that holds the surgical lens and the condensing lens assembly (CLA) that holds a condensing lens. 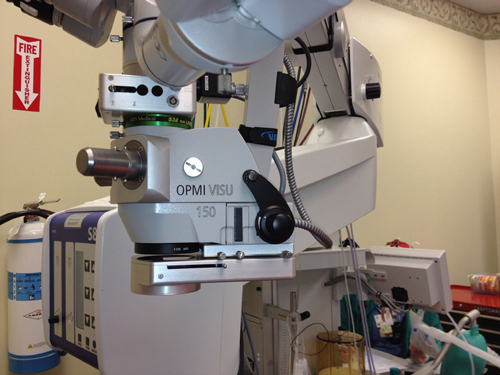 The surgical lens modifies the microscope optical system so that it images the retina. The condensing lens shortens the focal length of the microscope objective lens about 1 in, which allows the surgeon to move the LPU in and out of the optical path without having to move the scope up & down. In combination, the two components allow the surgeon to quickly change between corneal views (without the LPU place) and retinal views (with the LPU place) without making any adjustments to the microscope. Conventional viewing systems are either completely manual or require the surgeon to use a foot switch to move the condensing lens into position. With the help of a controller and a Precistep micro stepper motor from MICROMO, the MERLIN performs this task automatically as soon as the surgeon begins to swing the LPU into position. Add to that an industry maximum 5-mm of working space between the surgical lens and the eye, and you’ve got an accessory with the potential to significantly improve the surgeon’s experience—and performance. “The design was a matter of really doing whatever we could to give the physician as much room as possible while essentially providing them with the same type of features and performance as they expect,” says Matthew Holmes, manager of Volk’s Ophthalmic Surgical Products business unit. One of the key focuses of the design team was to keep the depth occupied by the MERLIN as small as possible. “Doctors are very sensitive to the height of the microscope above the patient,” says Bill Hudgins, manager of product engineering at Volk. “They don’t want us changing that too much. To fit into the existing enclosure, we really needed a small motor that we could put a gearhead on to get the speed and torque that we needed. That’s where MICROMO helped us out quite a bit. Because of size constraints, it wasn’t feasible to use a servo motor and encoder. Instead, they chose a 15- mm stepper motor combined with a controller board. Stepper motors tend to be highly deterministic— command a step, get a step. The microcontroller determines the direction and the number of pulses applied to translate the condensing lens in and out of the optical path. The electromechanical design process wasn’t entirely straightforward. Translating the lens required more torque than the micro stepper motor could supply. Under normal circumstances the solution would be easy—get a bigger motor. Given the size constraints presented by the application however, that wasn’t an option. Instead, the team added a gearhead to convert speed into sufficient torque to move the lens. MICROMO’s Express Prototyping service allowed the engineers to try out different types of gearing until they found the right solution. “We were searching for a combination to make a device that worked reliably and quietly,” says Hudgins. First, the team tried a metal spur gearhead that provided a 41:1 reduction. Next, they explored a plastic planetary gearhead with a 14:1 reduction ratio. “Our main consideration was getting the speed right and making sure that the torque was sufficient at the speed we wanted,” says Hudgins. The planetary gearhead provided the necessary torque and was also less expensive, so the team elected to go with it for the production model. The viewing system needed to perform, first and foremost, but it also had to be reliable. “These are expensive systems,” says Holmes. “They’re expected to last for years, so the whole design had to be a robust.” The gearhead connects to pulley and a belt drive actually moves the lens carriage. An optical sensor built into the bottom of the CLA detects the position of the LPU and the controller sends the command to the stepper motor. Volk is known for its expertise in high-quality optical components. The company wanted to bring that capability to the surgical viewing system but it also wanted to focus its engineering efforts on its core capabilities rather than pushing its optical technicians to become specialists in electromechanical assembly. MICROMO offered a custom solution by delivering an integrated package, not just a motor. “We asked them to add a gearhead to the motor so we could move the speed and torque to where we needed it to be,” says Hudgins. “More recently, we asked them to add custom cabling, so we could just buy the product and plug it straight into our boards.” Getting the motors with connectors already attached streamlines the manufacturing process. It also fits with Volt’s strategy of focusing on areas in which the company can bring most value, and letting its motor supplier’s expertise simplify production. Compared to the incumbent product, the MERLIN offers surgeons more working space between the bottom of the viewing assembly and the eye. Add to that simpler operation, quality optics, and minimum form factor, and the engineering process was a success. Volk has been actively selling the MERLIN since the summer of 2011 with a very positive response from customers and dozens of systems already deployed in the field. “The comments we’ve received from everybody so far is that they love it, this is what they’ve been looking for for years,” says Holmes. By developing a customer- centric design and choosing MICROMO as their electromechanical supply partner, Volk has positioned the MERLIN for long-term success. To meet size and torque requirements for the MERLIN surgical viewing system, the Volk Optical product development team decided to add a gearbox to the stepper motor that positioned the lens in the condensing lens assembly (CLA). MICROMO’s Express Prototyping service allowed them to try out several different types without having to wait a long period of time. The AM1524, a 15-mm-wide, 12-V stepper motor that delivers 6.0 mNm of torque. The 15A Planetary Gearhead, 15-mm- diameter plastic gearhead that provides a 14:1 reduction ratio. 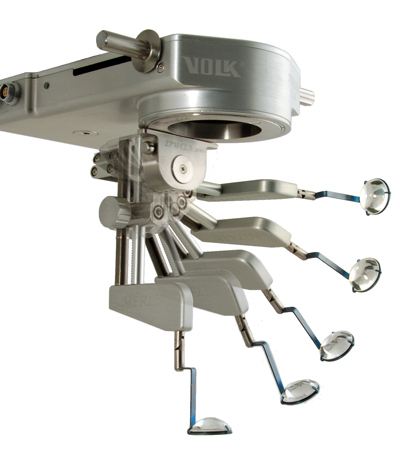 For more information on the Merlin surgical viewing system from Volk Optical click here.